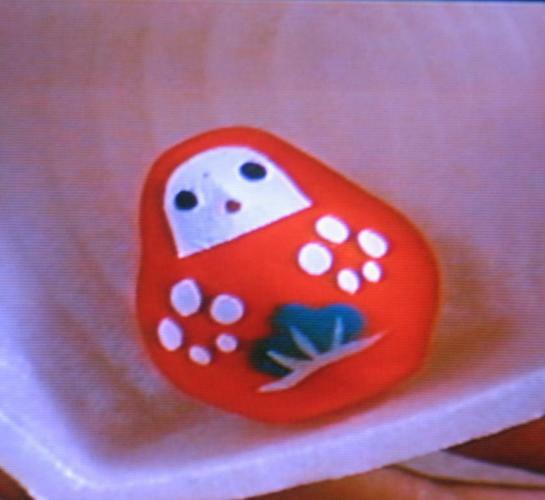 designed by Sergio Asti in 1967. Sergio Asti was born in 1926. He studied at the School of Industrial Desing in Milano, Italy. 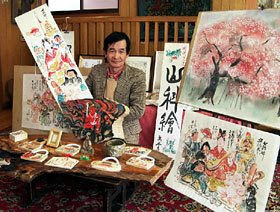 In 1983 he had an exhibition of his work in Kyoto. 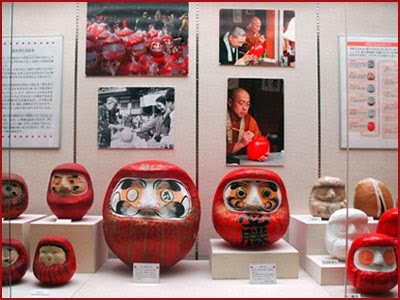 This is one of my favorite parts in the Daruma Museum! Imagine putting your christmas cookies there ! 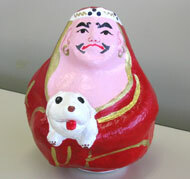 In Japan, it is also offered as a kind of lamp. When the Lord Maeda of the Kaga domain rebuild the tower Ni no Maru of his castel in 1809, he had special waffles made for the final celebration. 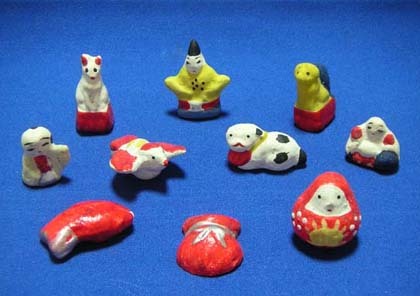 Inside these waffles were small clay toys like the beckoning cat, other sweets or little statues of auspicious deities, like Tenjin Sama. The sugary sweets are called "Gold Flower Sugar" (kinkatoo 金花糖). 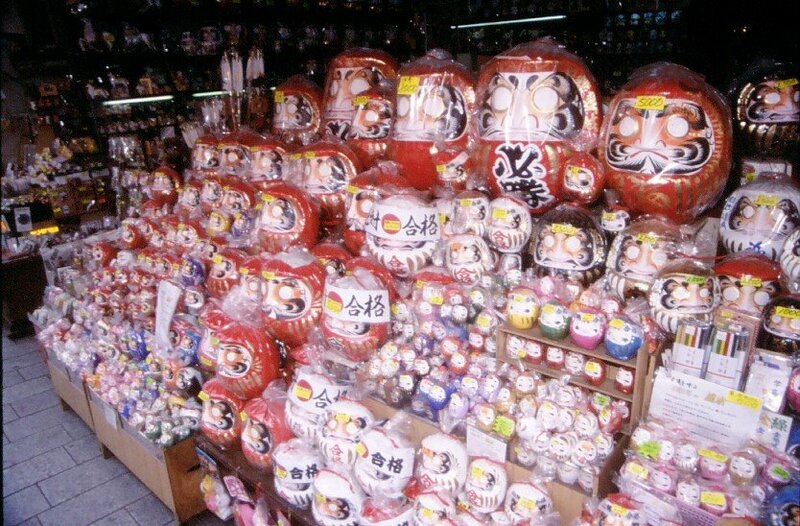 One of these wafers, in the form of an auspicious hammer (kozuchi) contained a small clay doll of a female princess Daruma, which is a speciality of this domain. 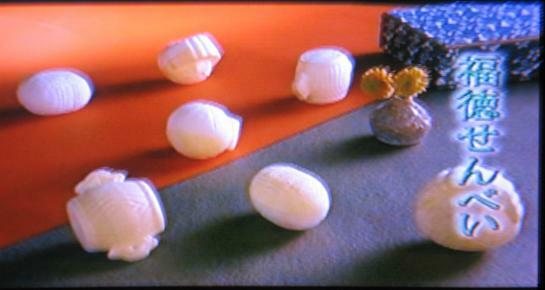 I took the photos from a TV program on sweets, they are a bit wobbely. The sweets were made by Rakugan Moroe-ya 落雁諸江屋 are made since 1849. Altogether they made 10 different types. 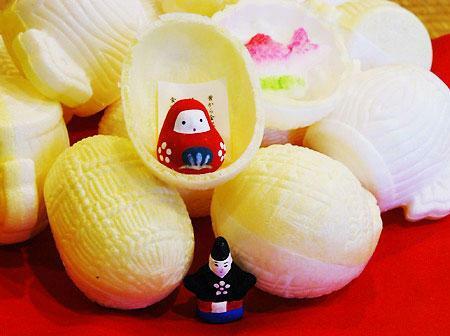 Now these sweets are a special fare for the New Year Celebrations. Some people like to shake the closed waffles and guess what is inside, which makes for a nice game during a New Year Party. Fortune Cookies 辻占福寿草They contain slips of paper with riddles in the local language. Wishing for a long life at the New Year, 金澤夢菓子「久寿玉」contains six different types of sweets. 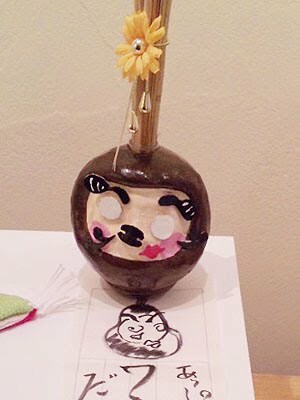 Some contain items to play with. 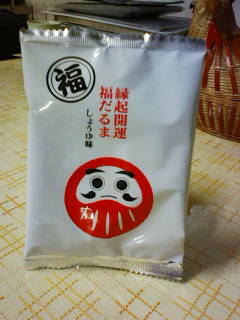 Another kind of normal senbei, with the taste of soy sauce. 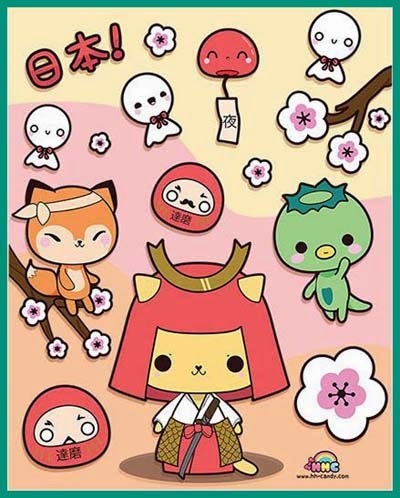 Photo from my friend Kyoko. 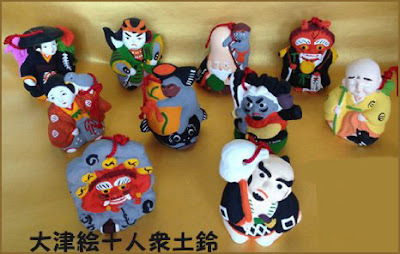 These small auspicious dolls have been used by the local sweet makers to decorate for the New Year and add them to the shopping bags of their customers. 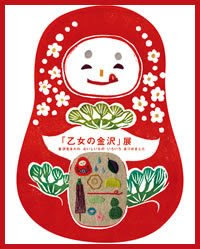 was one of the great German collectors of Japanese art in the early 20th century, deeply committed to enhancing public awareness and knowledge of Japanese art and crafts. His personal holdings of sword decorations and lacquerware in particular exceeded many museum collections of his time. Jacoby started collecting Japanese art seriously in 1899, and as early as 1903 was able to publish a series of sword guards from his collection in a catalogue. The first public exhibition of Jacoby's private collection in Berlin 1904, "Small Works of Japanese Art", featured almost 1,200 objects. 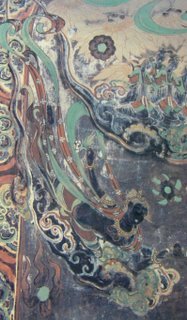 Jacoby was extremely generous, and made large material and financial contributions to the East Asian collections of several institutions: for instance, Jacoby helped transform the East Asian Art Collection in Berlin in 1919, donating virtually his entire collection. 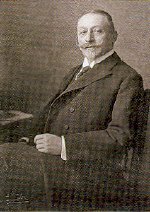 Unfortunately, the pieces he donated, together with the vast majority of the collection's other pre-war holdings, were confiscated as war booty by the Soviet Army and removed to the Hermitage Museum in St Petersburg, where they still remain today. 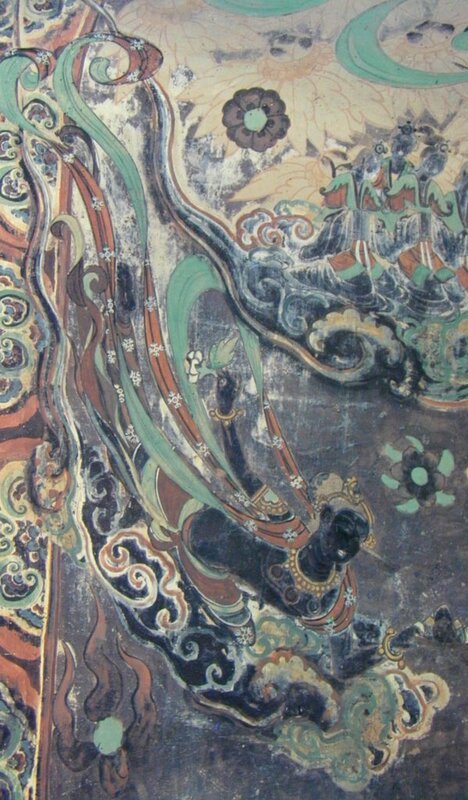 "Der Bōdhidharma der Sammlung G. Jacoby"
Dr Kurt A. Gitter and Alice Rae Yelen. 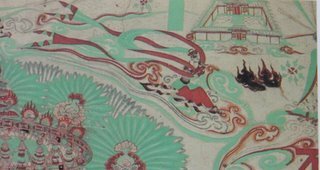 The exhibition will provide an introduction to the art of Zenga, literally ‘zen painting’, a term that refers to the ink painting and calligraphy created by Zen monks in Japan from 1600 to the present day. 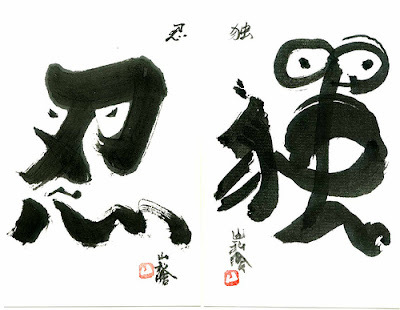 Zenga were used as a tool for meditation and spiritual teaching, and subjects range from fierce-looking Zen patriarchs to minimal landscapes, from intense calligraphy to whimsical illustrations of Zen conundrums. Characterised by their dynamic brushstrokes and often humorous images, these inspired works were mostly created by untrained painters who were monks first and artists second. 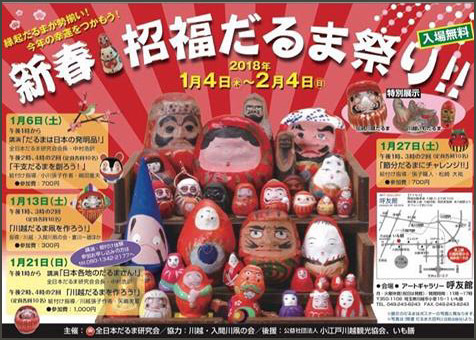 The exhibition will include zenga by the greatest Zen masters, such as the monks Fugai, Hakuin and Sengai, as well as works by Zen-inspired laymen and by monks from other Buddhist sects. 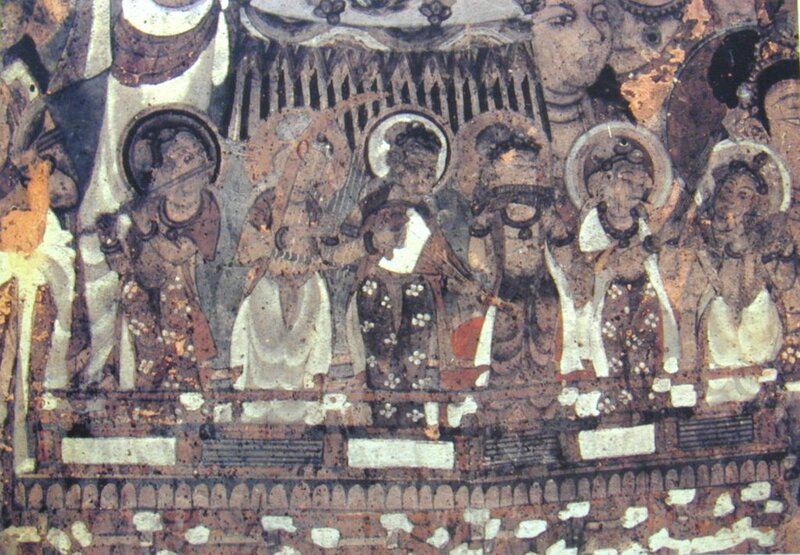 This is a hand-painted copy from the walls of the Stone Caves at Dunhuang, China. I bought it more than 15 years ago at the local museum, where these reproductions are sold quite expensively as a contribution to the preservation effort of the caves. 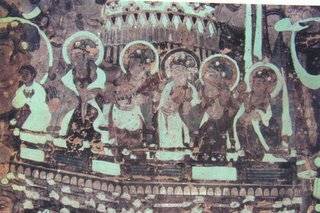 The painters sit in the cold caves for hours and meticulously copy the wall paintings, including the fadings and spots and missing parts. They are young aspiring painters who also make a living out of this work. For more about Dunhuang read the LINK of Mark Schumacher below. This page contains many photos, please be patient while they are uploaded. 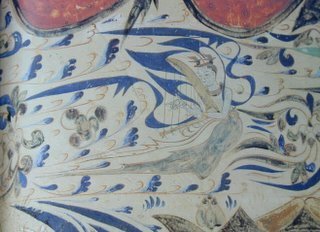 The photos will give you an impression about the changes of painting style, colors used during the ages and the kind of abstraction used. Some of them look like modern art to me. 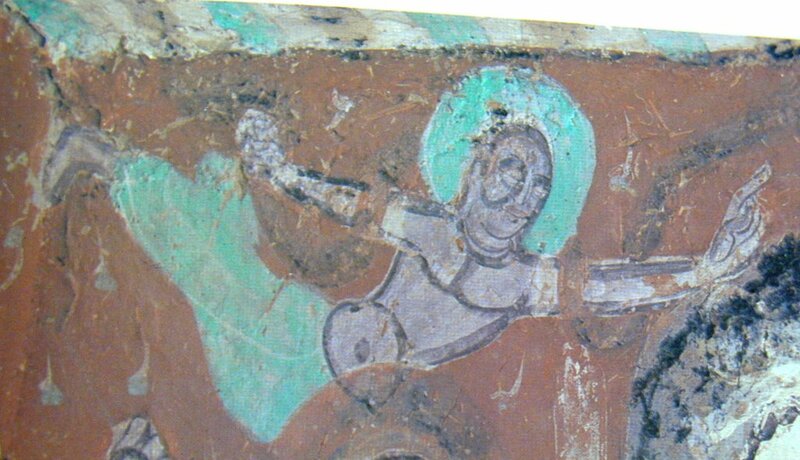 One of the major problems of wall painting at these times was to find the appropriate mineral colors that would last for a while. Kanshu Chugoku Sekkutsu Tonko Bakkookutsu Henshu Iinkai. 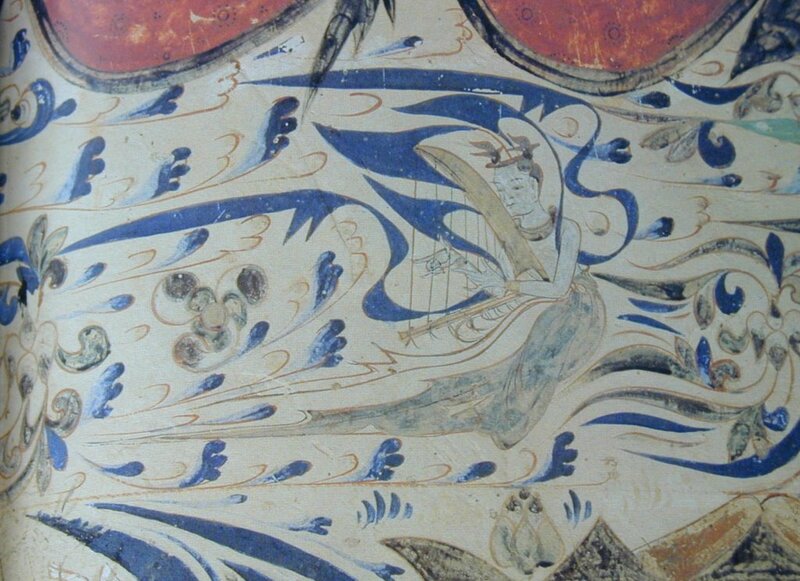 The musical instruments shown with these apsaras are now revived in China and used in orchestras. 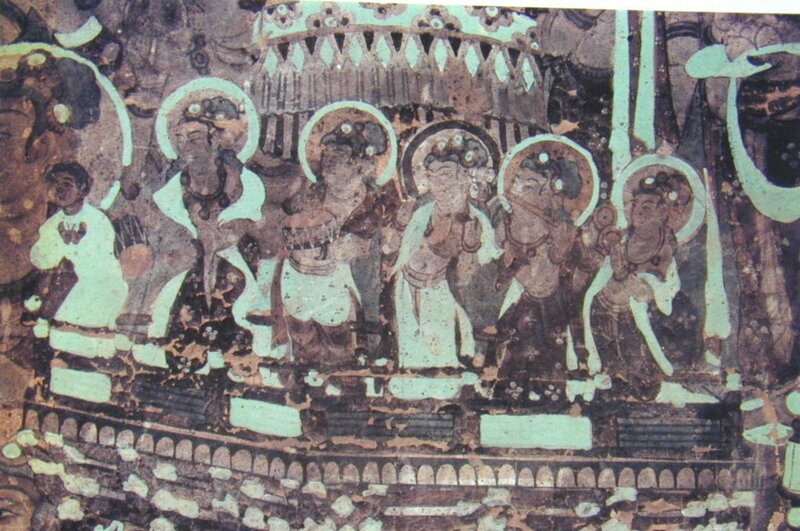 Here is a group with its instruments. 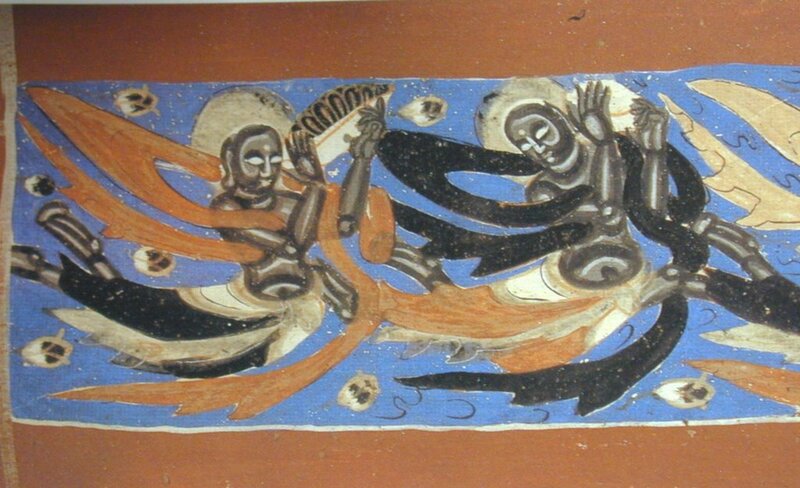 Celestial beings who play music, dance, and fly through the air. 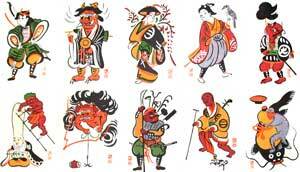 They appear in many forms, often with bird’s body and angelic head, and are sometimes associated with Amida Nyorai. 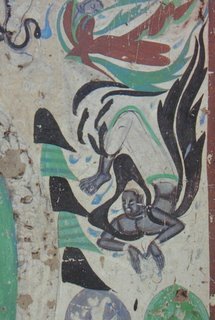 They appear often in Buddhist paintings, ritual robes, murals, and temple decorations. Mark will tell you all the necessary information about this subject. 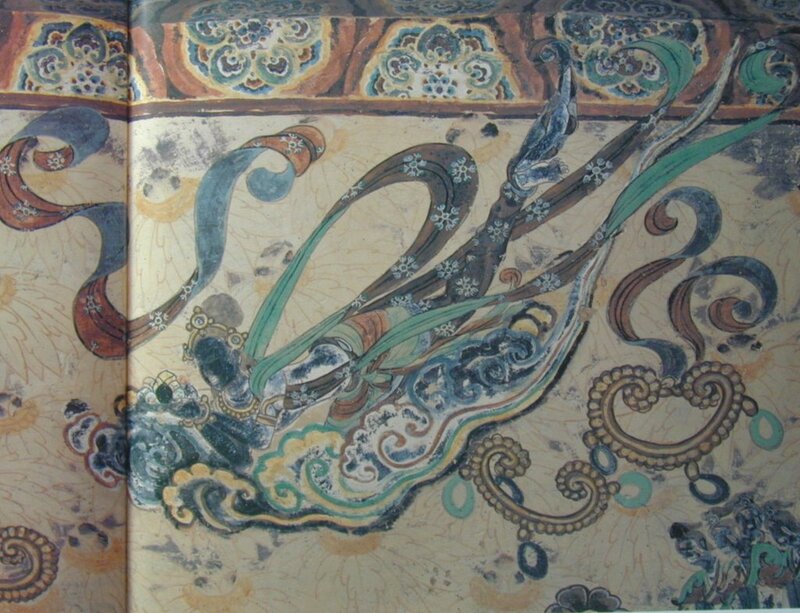 my professor of East-Asian Art at Heidelberg University. He told us about Dunhuang and the apsaras with so much enthusiasm, that it has since then been my wish to see them for myself. Heilige Gestalten stehen in der buddhistischen Theologie und Kunst selten alleine, vielmehr sind sie mit anderen, die mit ihnen einen gedanklichen und kultischen Zusammenhang haben, zu ikonographisch ziemlich feststehenden Gruppen verbunden. 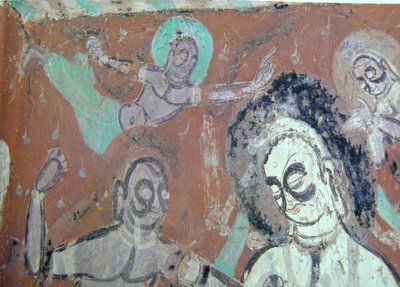 Zu jedem Buddha gehört ein oder meist zwei Bodhisattvas, in der esoterischen Schule auch ein Vidyaaraaja; ferner gehört zu ihm eine Gruppe beschützender und eine Gruppe anbetender Wesen (anbetende oder Weihgaben darbringende Bodhisattvas (kuyoo bosatsu) ) oder Apsaras, d.h. engelartige Himmelswesen, Adoranten, Jünger. 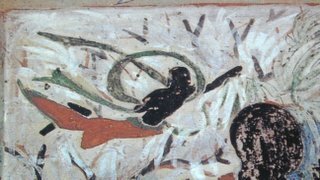 ... aber auch wenn göttliche oder halbgöttliche Wesen im Akt der Verehrung erscheinen, wie vor allem die Apsaras, werden sie in oft lebhafter, anmutig schwebender, fliegender, tänzerischer Bewegung gezeigt; und zwar treten solche Bewegungen geschichtlich sehr früh auf - nämlich schon in der Wei- und Suiko-Zeit. 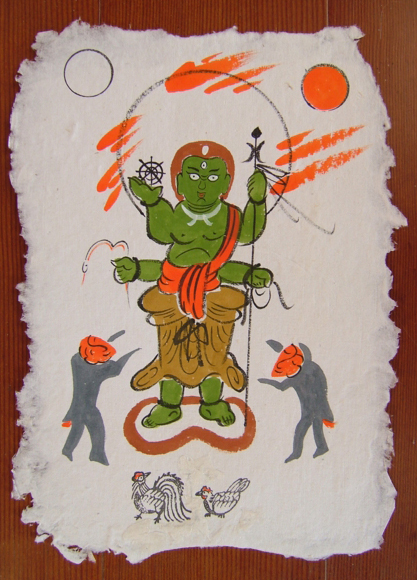 ... engelartige (doch mit den alttestamentlichen oder christlichen Engeln gar nicht vergleichbare) Bodhisattvas, die zur Verehrung (puja, puuja) eines Buddha herbeischweben und ihm Blumen, Weihrauch, Musik und Tanz als Weihgaben darbringen. 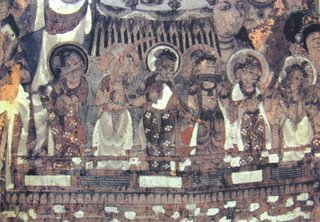 Sie und die ihnen ähnlichen Apsaras werden oft recht unpräzise als "fliegende Himmelswesen", "heavenly beings" und dergleichen bezeichnet. 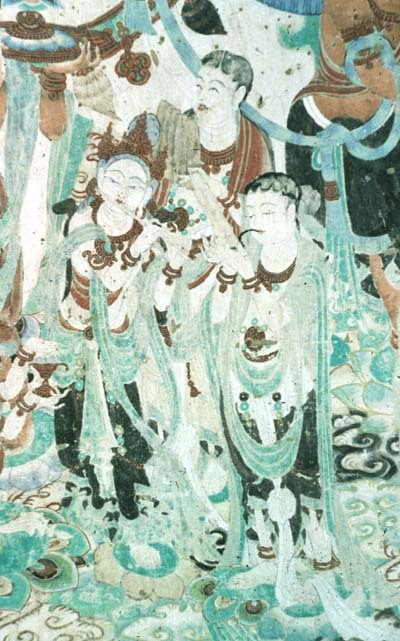 The Apsaras are female spirits of nature. Thye are usually water nymphs or forest spirits. They are considered very talented artistically, and all of them are described as being very beautiful. Apsaras love to dance and they often performed for gods. 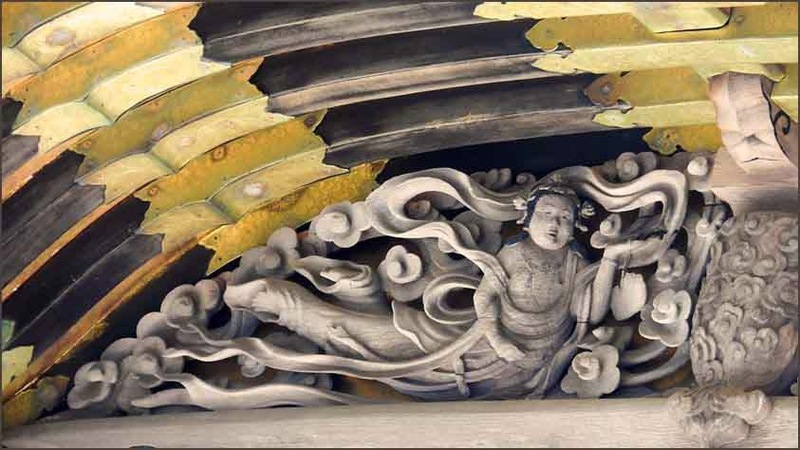 Though the term "apsara" is not used, the heaven-flying maiden is the figure seen in Japanese paintings of the maiden Hagoromo-- (the maiden of the Feather Mantle). She flys over Mt. 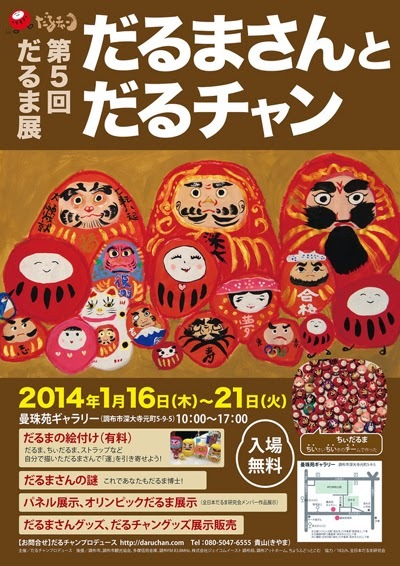 Fuji dropping feathers; these paintings are displayed at New Year's season. 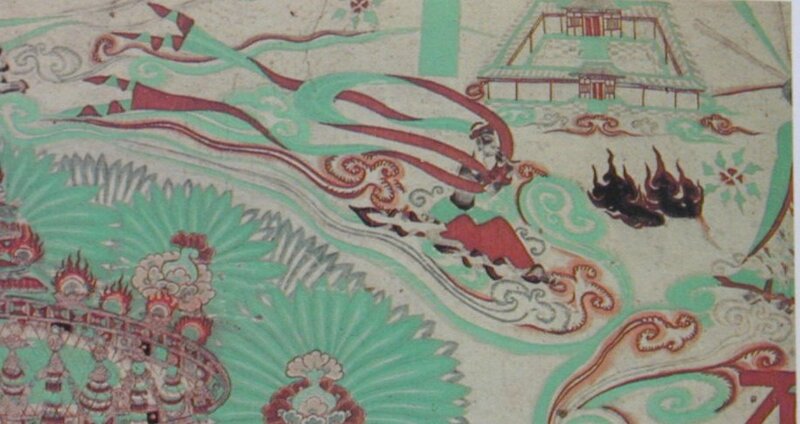 The story of the bird maiden goes back to an 8th century collection of provincial topographies _Fudoki_ (source: http://www.shermanleeinstitute.org/exhibition-spring05.html). 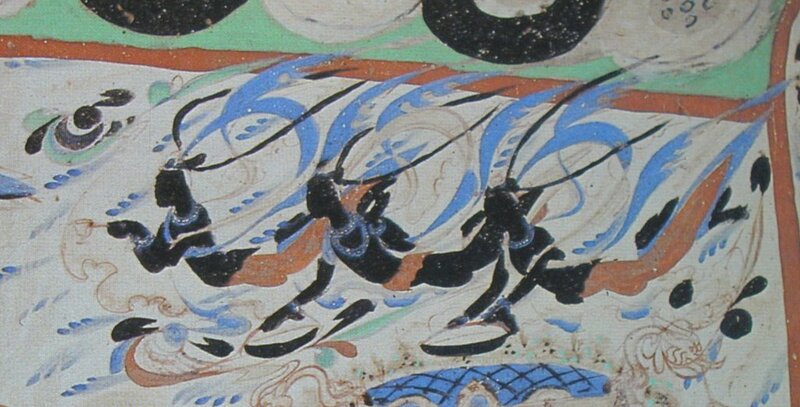 A group of birds changes into maidens to bathe in a lake. 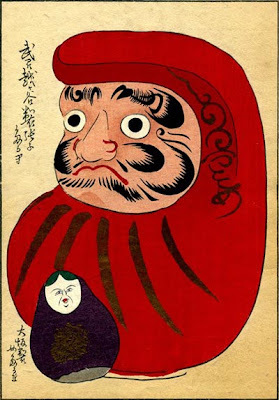 A man steals the feather robe (hagoromo) of the youngest, forcing her to marry him. 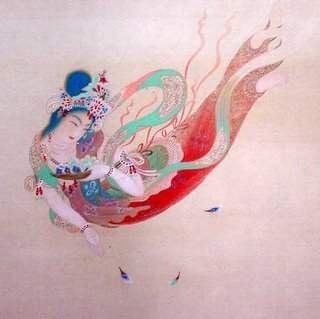 After many years, she retrieves her gown and returns to the skies, leaving her husband and their children behind. 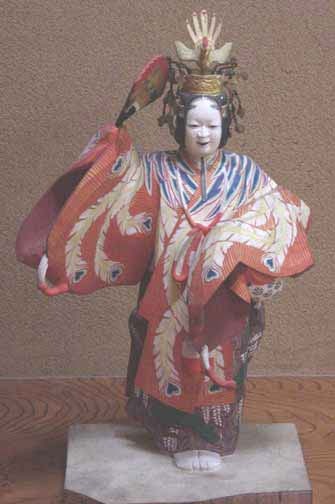 The later noh drama _Hagoromo_ tells of a fisherman who discovers the feather mantle of a heavenly maiden. The maiden asks him to return the garment to her. 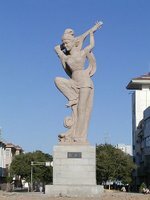 When he does, she rises into the sky dancing evocatively. 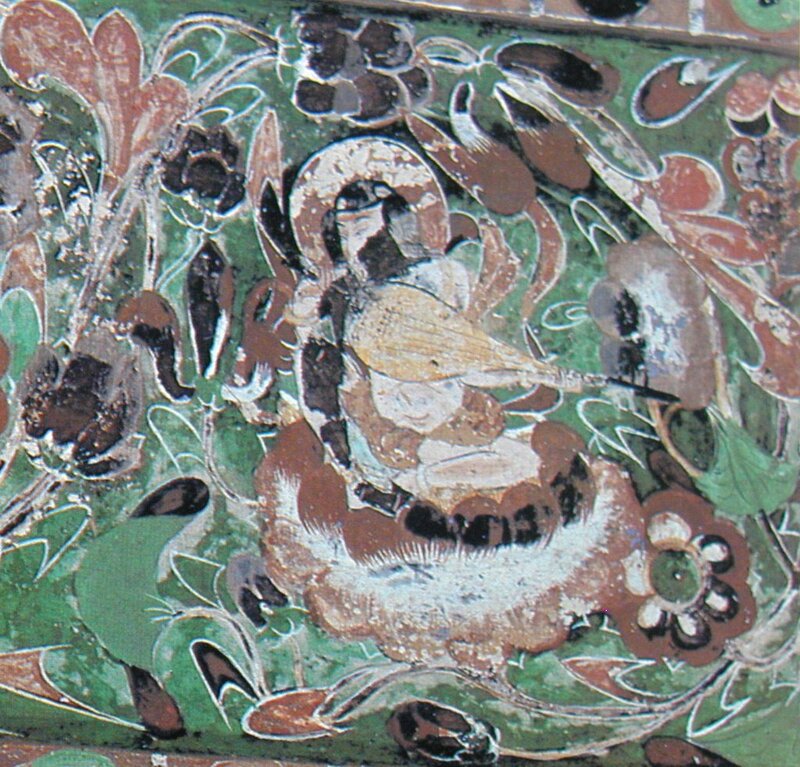 Feathers allude to good fortune (the return of a feathered "bat (homonym for luck)/birdie" in a paddle game) and perhaps to depiction of spirits descending through a natural object object (_yorishiro_ in Shinto belief), not unlike spirits descending to color the leaves from top to bottom in autumn as heaven's spirit descends to the dusty world in the Noh drama _Tatsuta_. 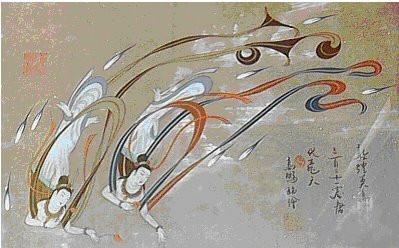 The dance of the maiden of the Feather Mantle is also replicated by the character of the Chinese historical beauty Yang Keui-fei (name changed) in the Noh drama _Yokihi_. The International Shakuhachi website www.komuso.com/pieces/Hagoromo_no_Kyoku.html references this maiden. 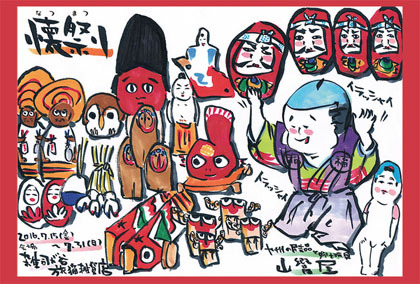 It includes the text of a poem set to koto music and notes: "One of the most profound of the kumi-uta that are classified into the deep interior (oku) category of the koto music repertoire (1), this song cycle 'Hagoromo no kyoku' ('Celestial Robes') is played frequently as part of the first musical event of the New Year Hikizome, a traditional ceremony that accompanies the First Reading, the First Writing and other ceremonies that begin the New Year in Japan." 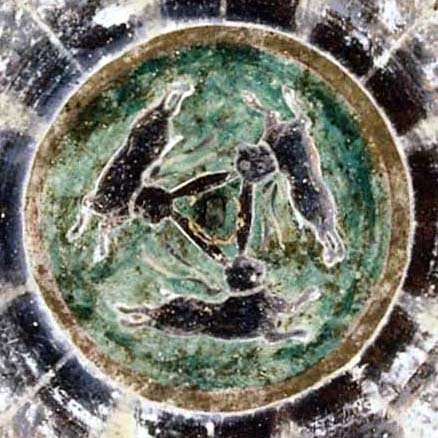 Triple hare symbols have been found at the caves.
. Kikaku, Takarai Kikaku 宝井其角 Enomoto Kikaku (1661-1707) . 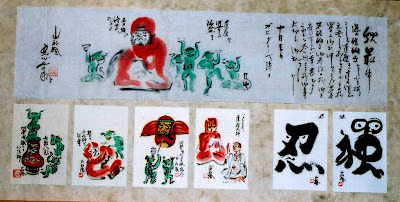 Many different characters were used to write Enoshima. 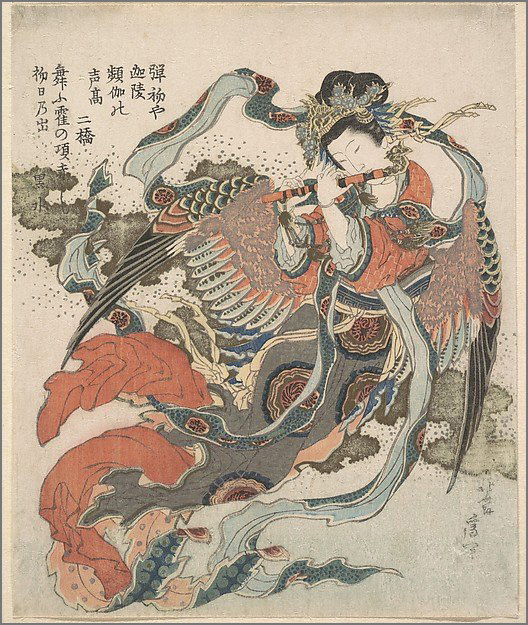 I think "heavenly woman" (tennyo) must refer to Benzaiten, an Indian female god associated with Buddhism who governs artistic ability, eloquence, knowledge, water, the ocean, and wealth. 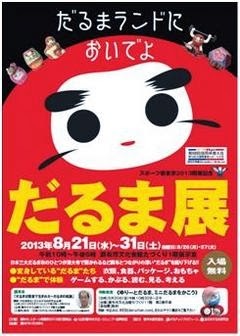 There is a famous shrine to her on Enoshima Island, not far from Edo. Benzaiten or, more commonly, Benten was worshiped by many Edo people, who often made pilgrimages to Enoshima Island, especially in spring. One of the two statues of Benten on the island is very famous and shows her playing a lute (biwa) naked. Benten is often referred to as a heavenly woman, and she is also represented by three Shinto gods, all sisters, so there were/are actually four heavenly women on the island -- and no male gods. 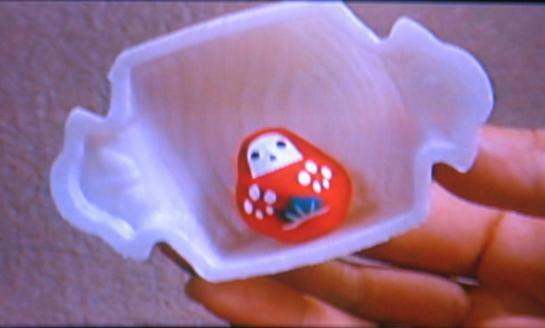 The meaning of the hokku is a little difficult, so this is just a first guess. 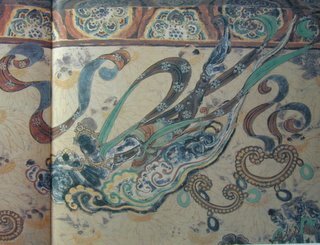 The first line refers to the wind blowing cherry blossoms on the island and onto the sea around it. The last line seems to refer to walking to or from Enoshima Island across a narrow ridge in the shore that at low tide connects the shore with the island but at high tide is covered. The verb kachi-wataru (written both 徒渡る and 歩渡る) means to ford or wade through shallow water up to about two feet high, usually in order to cross a stream or shallow river. As for the heavenly woman, I wonder if Kikaku isn't using the term metaphorically while at the same time referring to Benten. 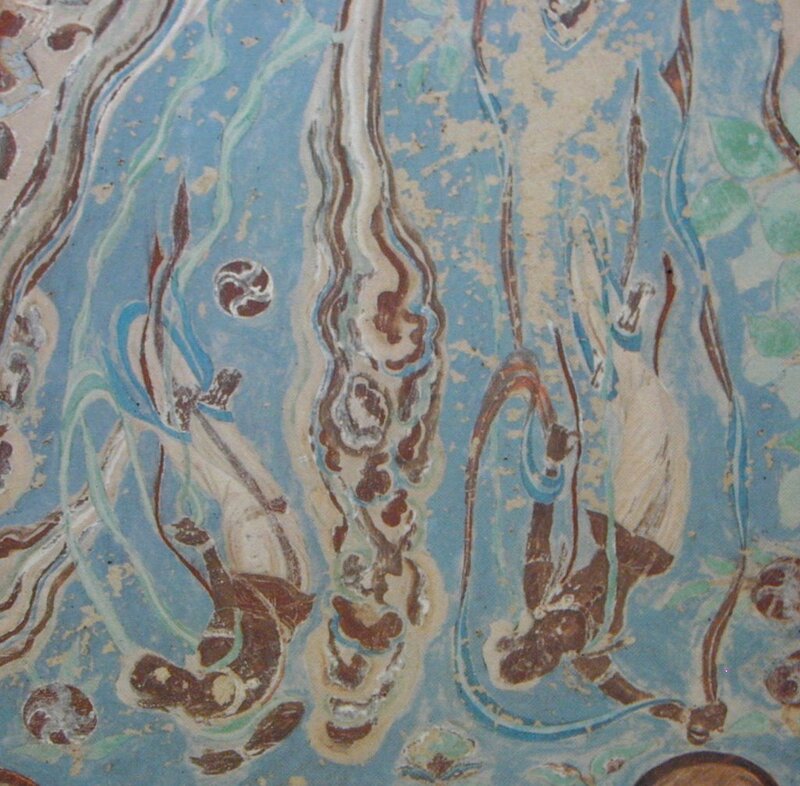 Perhaps the tide has started to rise, covering the natural walkway between the island and the shore, and one woman pilgrim in beautiful spring robes has hired a porter to carry her back to the mainland through the shallow water now covering the same ridge of sandy land she walked on earlier to get to the island. Or perhaps the women is traveling with a man, and now he carries her on his shoulders across the shallow water between the island and mainland at high tide.